DxOMark put HTC One M9 and its 20MP camera through the paces of its highly contested photography test. The Taiwanese manufacturer’s metal-clad flagship received the poor overall score of 69 (73 for still photography and 61 for video capture). 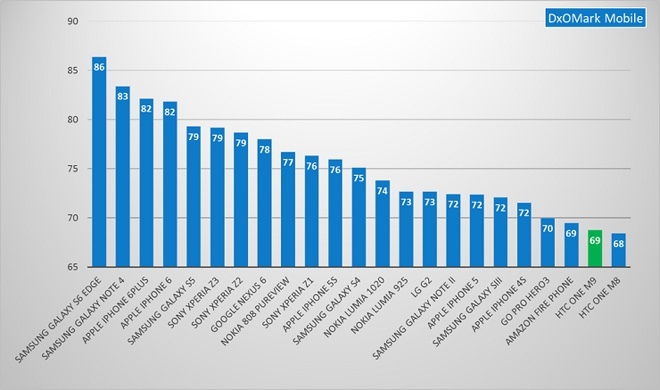 The result of HTC One M9 falls well behind the 86 points scored by the DxOMark leader, Samsung Galaxy S6 edge. The M9 shares 21st place with the Amazon Fire Phone and falls behind some decidedly devices such as Samsung Galaxy S III and iPhone 4s. In the still photography score breakdown, DxOMark gave HTC One M9 for pleasing colors, good details, and stellar autofocus in good light. However, oversaturated low light colors, inaccurate white balance, and loss of sharpness in image corners drag the still photography score down. Videos capture by HTC One M9 in bright light exhibit good noise reduction and accurate autofocus. Lost details, lack of video stabilization, and oversaturated colors in low light contribute to the low overall score. It is worth noting that HTC rolled out a couple of updates in a bid to improve One M9’s camera. It appears however, that the Toshiba-made 20MP sensor doesn’t cut it in today’s competitive environment.